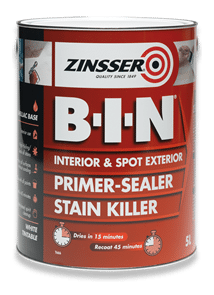 B-I-N® is the ultimate shellac-based primer, sealer and stain killer. It is perfect for use on inte..MORErior surfaces and spot priming of exterior surfaces. B-I-N® offers unparalleled adhesion to glossy surfaces - including glass - without the need for scuff sanding and blocks stubborn and persistent stains. The high adhesion shellac formula seals porous surfaces with excellent enamel holdout, even sealing bleeding knots and sap streaks. B-I-N® works brilliantly on water stains, fungal degradation, nicotine, oil stains, marker pens stains and more. If not treated properly, graffiti can reappear through new paint work. This method explains how to permanently cover up graffiti stains.